I am writing my blog after a gap of few days so if you have missed reading my thoughts I am sorry sometimes I get caught up in certain intricacies related to my office work but I will try again to be regular with my passion. Today, I am going to talk about” Rahul”… Hey, wait if you are the one following my blog regularly it is not about the Rahul I talked about earlier in my blog who came as a kind stranger… My life is so full of “Rahooools” and I don’t know what kind of prophecy my angels are trying to guide me with that every single man I meet turns out to be Rahul. And I met this Rahul a spiritualist with whom I share a special relationship like a radio with its frequency. Sometimes it is easy to tune with his thoughts and sometimes the connection gets loose and we refuse to talk to each other for months..
As I was recalling living incidents of my life before writing this blog, I recalled that in every chapter of my life I have met one or the other guy named Rahul and this Rahul has made a “guest appearance” with his poems and vanished off, only to meet again. This Rahul is none other than Rahul Atrishi. Devotee of ‘Meher Baba”. In his own words he is a wordsmith and indeed he is. As for me, many times, his poems have bought solace to my soul. I have always liked his work. 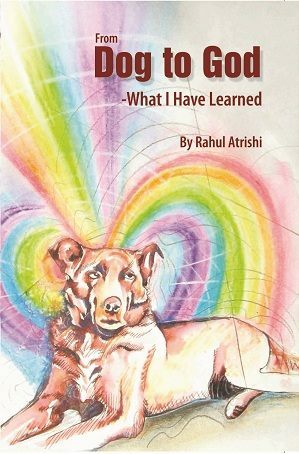 This Saturday, when I received his book “From Dog to God” I never knew that he was a dog lover (by the way call it co incidence or quirk of fate whatever but all the Rahoool’s who so ever I have met till date are dog lovers) I was amazed with his writing skills and the curiosity he had created of what happens next made me fall in love with his wonderful writing skills one more time. So till date I had known Rahul Atrishi as a poet and now a story teller. I have read the book and stopped in between to reconcile lessons I had lived with humans and animals in my life. Did I ever care about the word “Perspective “? Do give this book a chance and you would never regret. As for me with Rahul’s in my life they have always taught me valuable lessons of life to live and to die while living this long life… I would be grateful to each and every Rahul for crossing my path once in this life time… Wondering if any more Rahul is on his way …… Anyway gotta go.. will catch up tomorrow with some other thought wandering on my mind … till than have a lovely week ahead and yes you can find Rahul Atrishi on face book and can also log on to his website www.rahulatrishi.com for ordering his second book “From Dog to God”…. I wish Rahul Atrishi all the very best with his career in writing and in his personal life ahead.